German reunification in 1990. Mecklenburg-Vorpommern is the sixth largest German state by territory, and the least densely populated one. The coastline of the Baltic Sea, including islands such as Rügen and Usedom, as well as the Mecklenburg Lake District are characterized by many holiday resorts and pristine nature, making Mecklenburg-Vorpommern one of Germany’s leading tourist destinations. Three of Germany’s fourteen national parks are in Mecklenburg-Vorpommern, in addition to several hundred nature conservation areas. Major cities in Mecklenburg-Vorpommern include Rostock, Schwerin, Neubrandenburg, Stralsund, Greifswald and Wismar. The University of Rostock and the University of Greifswald are among the oldest in Europe. 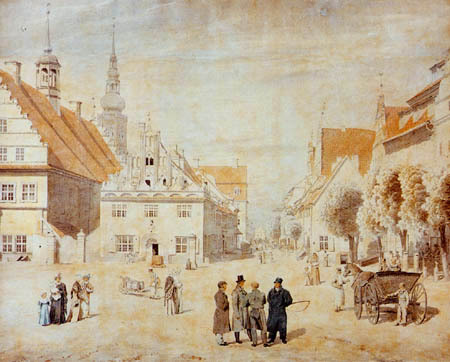 Over the centuries, Mecklenburg and Vorpommern have developed and maintained strong regional cultures. It can generally be described as North German and has similar linguistic and historic characteristics to other north German states, such as Schleswig-Holstein. The cities are characterized by a certain “Hanseatic” style also found in other parts of northern Germany as well as in countries bordering the Baltic Sea. 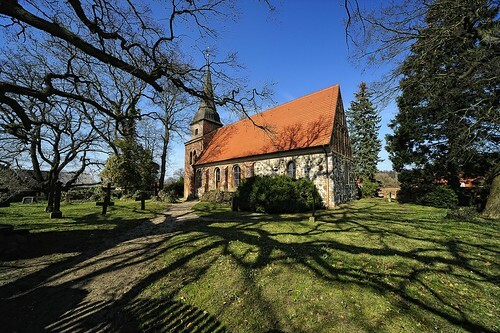 A common feature of many towns in Mecklenburg and Vorpommern are Gothic red brick churches dating back to the middle Ages. The old towns are usually built around one or several market places with a church or town hall. Often towns were founded at the Baltic Sea, one of the many lakes or a river for logistical and trade motives. The largest publicly-funded theaters in the state are the Mecklenburg State Theatre, the Rostock People’s Theatre, the Theatre of West Pomerania, with venues in Greifswald, Stralsund and Putbus, and the Mecklenburg State Theatre at Neusterlitz with venues in Neubrandenburg and Neusterlitz. Since 1993, the Störtebeker Festival has taken place in Ralswiek on the island of Rügen. 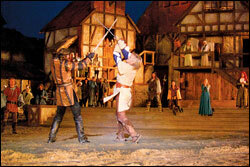 It is Germany’s most successful open-air theatre. Notable museums include, for example, the Schwerin State Museum and the Pomeranian State Museum at Greifswald. The German Maritime Museum with its Ozeaneum in Stralsund is the most popular museum in northern Germany. Furthermore, the German Amber Museum in Ribnitz-Damagarten, Rostock’s Abbey of the Holy Cross and Rostock Art Gallery are of national importance. Mecklenburg-Vorpommern is home to many cultural events throughout the year. During summer, many open air concerts and operas are open to visitors. The Mecklenburg-Vorpommern Festival (Festspiele Mecklenburg-Vorpommern) attracts a sizeable audience by performing classical concerts in parks, churches and castles. 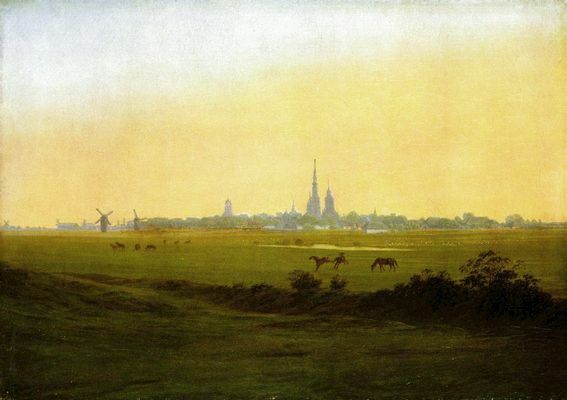 Caspar David Friedrich, a famous romanticist painter born in Greifswald, immortalized parts of the state in several of his paintings. Like most German regions, Mecklenburg and Vorpommern have their own traditional dishes, often including fish, beef and pork. Rostock has its own type of bratwurst called Rostocker Bratwurst. An unusual food from Western Pomerania is Tollatsch. Rote Grütze is a popular dessert. The largest brewery produces Lübzer Pils. In Mecklenburg-Vorpommern, approximately 732,200 people were gainfully employed in 2008 with 657,100 of them were withe and blue collar workers. About 4,200 new jobs were created in 2007. Employees worked an average of 1,455 hours a year. The number of self-employed did not change in 2008. Three out of every four of all people in work are employed in the service sector. The biggest businesses in Mecklenburg-Vorpommern are the ferry operator Scandlines AG, the NETTO supermarket chain, the shipbuilders Aker MTW Werft, Volkswerft Stralsund GmbH and Aker Warnow Werft GmbH, the Energiewerke Nord GmbH and the shipping company F. Laeisz GmbH. 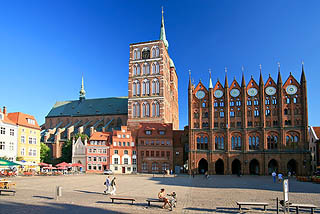 Cities: Stralsund and Wismar, both listed as UNESCO World Heritage Sites, Rostock or Greifswald which have a large cultural heritage. As a relic of the past, nearly 2,000 castles, palaces and manor houses exist in Mecklenburg-Vorpommern, many of which function as venues for public events like concerts and festivals.